Click anywhere on the picture and see. This rare Divisional Cavalry regimental photograph was taken at Hopu Hopu Military Camp, near Ngaruawahia, in the Waikato, New Zealand, in October 1939. Here are Mounted Rifles troopers, NCOs and officers, mostly part-time soldiers, assembled from all over the country. They are wearing brass hat and collar badges. New volunteers, who have just joined the regiment, have no badges. 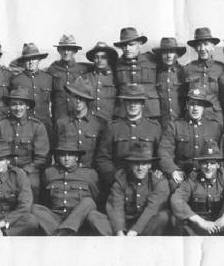 Together, these men formed the core of the 2nd New Zealand Divisional Cavalry. Click on any DivCav soldier you think you may know. A new page will open to show a close-up, detailed picture of him and the men around him. Click anywhere above or below to get started. See if you can recognize a family member or friend who served in the regiment. If you do, tell us who he is and what you know about his wartime service. New Zealand's famous Mounted Rifles Regiments are descended from the Auckland Militia and North Island Volunteers, both militia units, commanded by Lt.-Col. Joseph Henry Banks (1843-1916), a British cavalry officer attached to the 7th Dragoon Guards. Banks raised and trained six out of a total of ten New Zealand Mounted Rifles detachments which served with distinction in the Second Boer War in South Africa (1899-1902). In essence, a mounted rifles regiment was a mounted infantry unit, organized along cavalry lines. Horses gave the troops mobility; in battle, the men dismounted and fought as infantry soldiers. Remember, armies weren't motorized at the turn of the century; the automobile or truck hadn't been invented. Armies marched into battle on foot -- or on horseback. Based on their success in South Africa, mounted rifles units were seen as a ‘new idea’ by the British Army, and their formation was encouraged throughout the British Empire. Following the Boer War, in 1911, twelve mounted rifles regiments were organized in the Auckland, Wellington, Canterbury and Otago Military Districts to form the New Zealand Territorial Force. Each regiment consisted of part-time ‘territorial’ soldiers led by local officers and a small contingent of full-time professional soldiers. At the outbreak of World War 1, the names, badges, and a squadron of men from each regiment, were drafted to form the New Zealand Mounted Rifles Brigade, part of the 1st New Zealand Expeditionary Force, commanded by Major-General Alexander Godley. The Brigade saw service at Gallipoli, in the Middle East and on the Western Front. After the Great War, our mounted regiments reverted to their territorial role. Part-time service in the Mounted Rifles was especially popular among young men in rural farming districts. In October, they came together at Hopu Hopu in the Waikato, and Papakura near Auckland, to form what would become the 2nd New Zealand Divisional Cavalry. The regimental photograph (above) documented that historic coming together. Although horses were not-so-long gone, the DivCav would continue to be a highly mobile unit, mounted in light armoured fighting vehicles, light tanks, armoured cars, and even on motorcycles. Throughout World War 2, the primary role of the DivCav was forward reconnaissance to scout new ground, identify enemy locations, and gather intelligence for the battles that New Zealanders fought. DivCav despatch riders carried orders and essential communications through the thick of battle. And the regiment was often the last to leave the battlefield, providing a protective screen for the division, brigade, or fighting unit. In Crete (1941) and Northern Italy (1944), Divisional Cavalry troops dismounted and fought as infantry, just as their Mounted Rifles antecedents did in the Boer War and First World War.